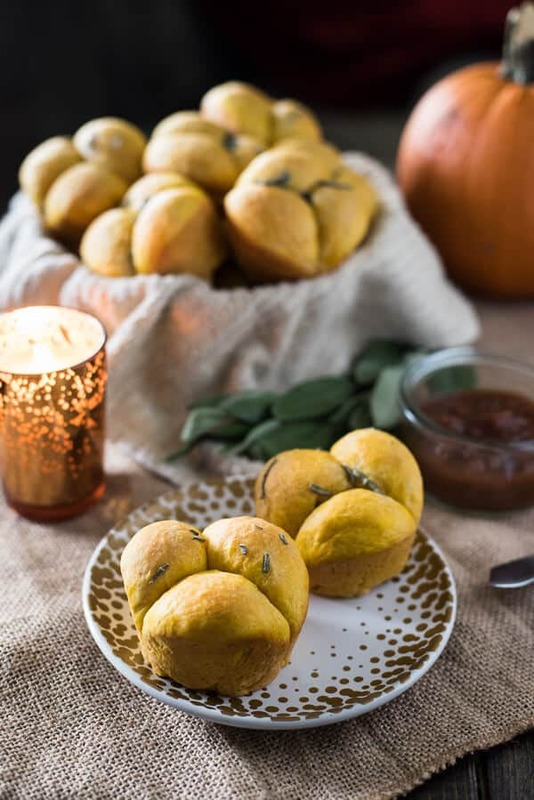 Perfect dinner rolls with a fall twist! 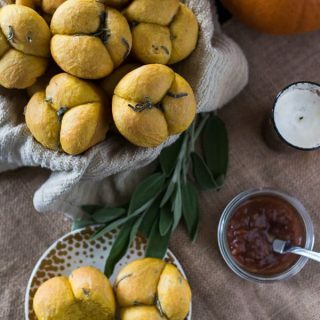 These Pumpkin Sage Cloverleaf Rolls are slightly sweet, super fluffy, and smothered in melty sage compound butter. Here’s a category I haven’t yet touched in this blogging career of mine – dinner rolls! As a person who loves carbs almost as much as breathing, you’d think I would have shared a roll recipe or two in the last two years. Honestly, just before I first started the blog, I was a regular Martha Stewart – experimenting with yeast and pumping out breads, rolls, even my own croissants and danishes on a semi-regular basis. I even had a sourdough starter that I regularly fed. I know, right?! Of course, I had a bit more free time to play around with back then. Those were the days. 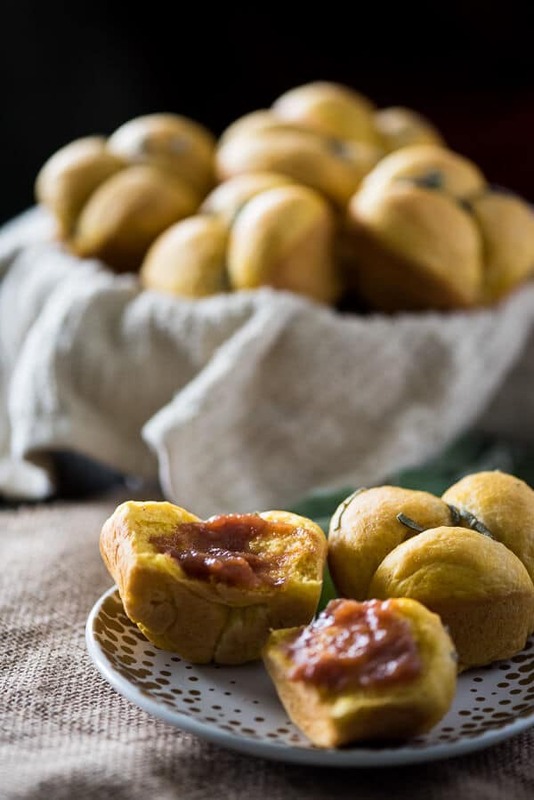 JUST TAKE ME TO THE PUMPKIN SAGE CLOVERLEAF ROLLS ALREADY! If you’d rather skip my (pretty darn helpful) tips and tricks, essential cooking info, and similar recipe ideas – and get straight to this deliciously easy cloverleaf dinner rolls recipe, just scroll right on down to the bottom of the page where you can find the printable recipe card! I miss those days. I still get to play with dough 5 days a week, but it’s at work, and it’s not as fun when the end results aren’t original or creative. 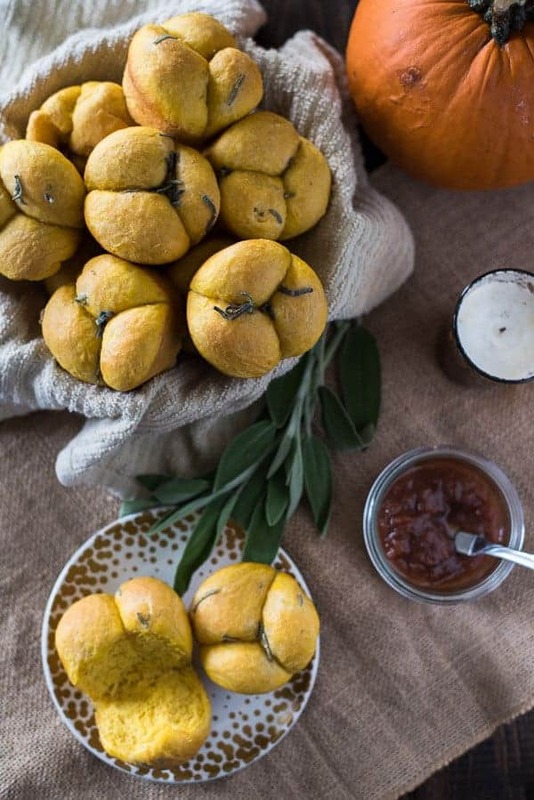 These Pumpkin Sage Cloverleaf Rolls made their debut last Thanksgiving. I can’t tell you how many years I’ve bought a pumpkin to carve for Halloween just to have it sit uncarved on the counter. Last year was no exception, except I had some wild hair spring up that made me want to roast, cube, and freeze it for future use. You can never have too much pumpkin, as far as this girl is concerned. And I was fully aware that carving and pie pumpkins are totally different, but that’s why we have pumpkin spice, right? My chance to use the fruits of my labor came on Thanksgiving Day, when I felt like my 3 pies and homemade cranberry sauce just weren’t enough to haul the 6 blocks we were driving to share dinner with my best friend and her family. I get a bit overzealous come the holidays. After working myself to exhaustion the day before the holiday, instead of relaxing on the day of, I go crazy in the kitchen. Can’t help it. Call me an overachiever, but I just really love making yummy food for people I love. These pretty little (decently sized, actually) rolls are a perfect accompaniment to a turkey dinner! Or lamb, or prime rib…whatever it is you’re nomming on, the seasonal sage-squash combo just can’t be beat. Whether you’re dipping them in gravy, using them to scoop up mashed potatoes, or simply spreading my homemade apple butter on them as an after dinner snack, they’re utterly delicious pumpkin perfection. 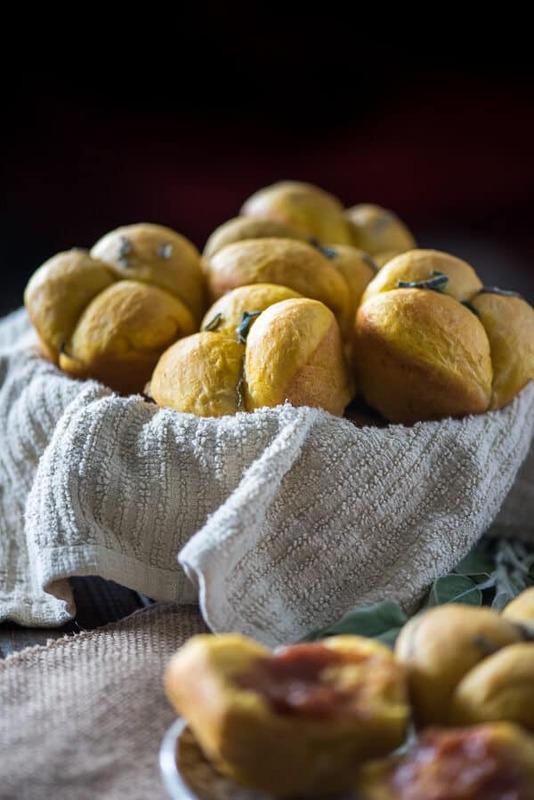 And for even more sage-y goodness, knead some fresh leaves into the dough before resting it, and brush the baked rolls with cinnamon butter instead. Sage and sweet. My heart is all aflutter. I can’t wait to stuff my face with these come Thanksgiving! Missed yesterday? Check out my Mini Pumpkin Pecan Cheesecakes! LOOKING FOR MORE ROLL & BREAD RECIPES? In the bowl of a stand mixer fitted with a paddle attachment, dissolve yeast in warm water, allowing it to sit 10 minutes. Grab a standard muffin tine and keep handy. Add brown sugar, pumpkin, egg, milk, ¼ cup melted butter, and salt, mixing well. Slowly mix in 2 cups of flour, then mix on medium speed for 2 minutes until incorporated. Adding ½ cup at a time, mix in enough flour to form a soft dough. 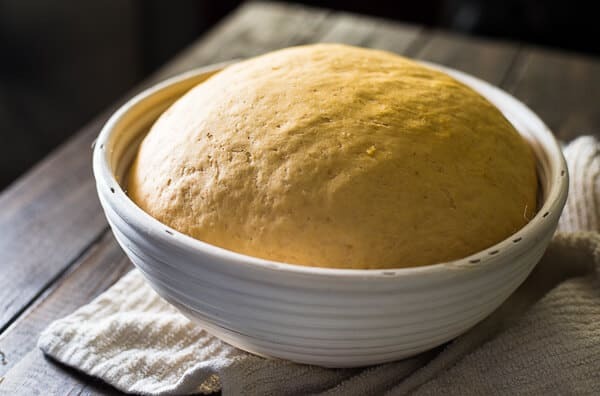 Knead by hand for 5–7 minutes or in a stand mixer (with hook attachment) for 3–4 minutes, adding as little flour as possible until a smooth, soft dough is created..
Spray a medium mixing bowl with cooking spray, the place dough inside and turn once to grease top. Cover with a clean kitchen towel or plastic wrap and let it rise in a warm spot to rise for 45 minutes to 1 hour, until it has doubled in size. Melt the remaining butter in a small bowl, and whisk in the chiffonade sage. Punch the dough down and turn onto a lightly floured surface. Divide the dough in half, then cut each half of the dough into 6 equal-sized pieces to form 12 pieces of dough. Divide each piece into thirds and roll the pieces between your hands to form balls. 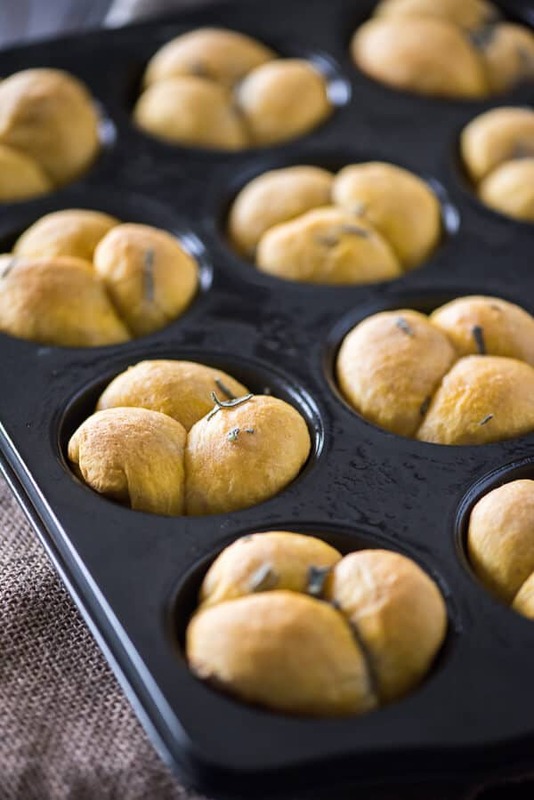 Dip each ball into the melted butter to coat, then place the 3 buttered dough balls into one cup of a standard muffin tin. Preheat oven to 350 degrees F while rolls are rising. Bake for 15-18 minutes or until browned. Brush the tops with remaining butter, then remove from pans to wire racks to cool. Look what else is going on today in Pumpkin Week! You had me at Sage. I think these little beauties may adorn my Thanksgiving table this year. Thanks.